MAN’S eyes will come closer and closer together, the bridge of the nose will further diminish, and finally the two eyes will again become oneâ€”just one large, Cyclopean eye in the center of the faceâ€”if the predictions of Dr. Thomas Shastid of Duluth, Minnesota, come true. Dr. Shastid, eye specialist and editor of many optical magazines, bases his predictions upon his years of study of the eyes of humans, of animals, and of fish. The left eye is being used less and less todayâ€”and soon will not be needed. The new eye will have two spots of sharpest vision in each eye, just as many birds have today, to obtain stereoscopic vision. Although the field of view will then be narrower than now, the eye will be exceedingly acute for colors, for motion, and for form. It will probably be able to perceive as light many forms of energy which now produce in human eyes no sort of impression. Dr. Shastid found that the eyes of birds are the best on earth, and are sometimes 100 times as good as those of man. They can not see blues or violets at all, but can see infra-red radiations. Horses can see almost nothing above their heads because the lower part of their eyes are practically blind. The upper part gives off a bluish sparkle, however, which enables the horse to travel well in the dark. I like it that althought he only has one eye, the haircut still seems rather normal. Only one thing to say: WTF?!? I was trying to post a photo of Roger Rabbit. I remember him having one large eye shaped like a snorkerler’s mask, with two pupils inside. Odd I can’t prove it to my virtual pals here. I’m pretty sure stereoscopic vision doesn’t work that way. “Stop moving around! I don’t have great depth perception you know!” Taranga Leela. What this doctor doesn’t seem to understand is that evolution gives future generations what best helps past generations to survive and produce offspring, not what would be most convenient to desk workers. You don’t have more offspring if you can concentrate better in a lab; you have more offspring if you can avoid being in a car accident, and that is more likely with two eyes. Brilliant research! Who needs depth perception, or redundancy, when we just sit and read blogs at our computers all day long! I look forward to seeing the early changes in my great grandchildren… not. Even in 1934 this was nonsense. Darwin himself knew better. Is anyone else thinking of Leela from Futurama? where exactly does he get the idea that the left eye is used less and less? also, the last two paragraphs are completely irrelevant. 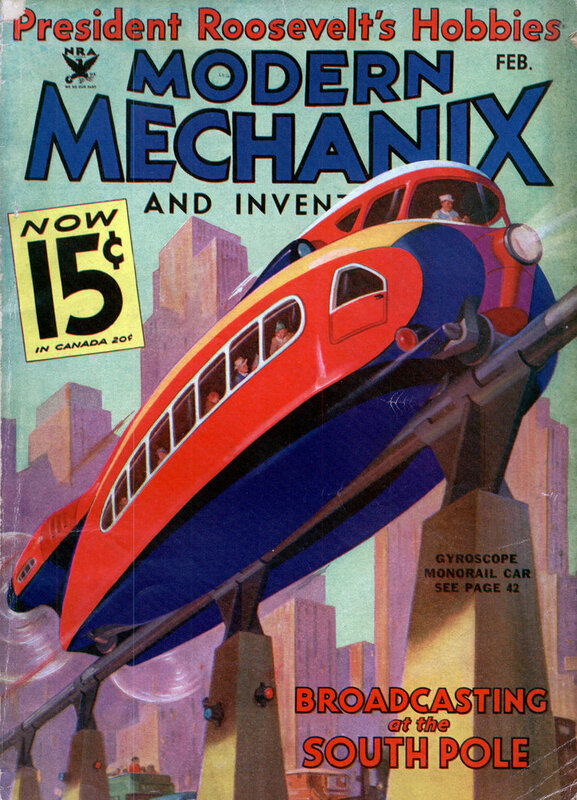 Another article that proves that Modern Mechanix is the precursor to Mad Magazine. Bayard: Well, here is the book that he wrote in 1926 where he lays out his theory. Page 199 I believe.